Linear’s Access Control Security Systems are manufactured to meet the security needs of any facility whether small or large, commercial or personal. Designed with a wide variety of features and options, Linear’s Access Control Systems ensure that any facility will be properly secured. At BEC Integrated Solutions we offer numerous Access Control Security Systems that are both technologically advanced and user-friendly. Linear’s IEI brand Access Control Security Solutions are accessible, dependable and innovative. They add efficiency to a facility by allowing security teams to respond quickly to incidents. These Access Control Security Systems are manufactured to adapt as a facility’s needs increase. Linear’s Access Control Security Solutions Systems are designed to supervise the arrivals to and the departures from a facility with as many as 32 entryways. The IEI line of Access Control Systems include eMerge which has no software installation necessary, Secured Series PC Based panel systems that are protected and managed from a central location, and small area single-door systems. We also offer Linear’s Door Gard Access Control System; an indoor/outdoor standalone keypad for entry access. Control locksets are available in all shapes and sizes to accommodate any number of entries. No matter the needs of a facility, our Access Control Systems can meet them. Linear's PC-Based Access Systems offer reliable service that is not only unique in the security industry but accessible and affordable as well. With a PC-Based system you can start small with the option to expand over time. Our systems are designed to adapt to any facility’s security needs. Facilities of any size can benefit from our Browser-Based Access Control Systems whether a centrally managed system or a single-door system is needed. Linear's stand alone access control keypads offer building security without the hassle of additional software or central monitoring systems. Use a stand alone keypad on each door requiring access control. Not only are our stand alone access control keypads simple to use and easy to install, they are also fully capable of keeping unauthorized visitors from entering a facility without an access card or code. 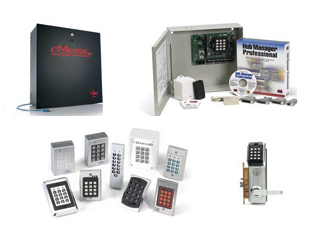 We offer the LS1, LS2 and LS2P models of the LS Series Electronic Access Control Locksets. These Locksets easily replace traditional locks to add further security to a facility. The LS Series Electronic Access Control Locksets offer easy and quick entry only to those programmed and allowed entrance. The LS1 can be setup directly from the keypad and allows as many as 120 users to enter. The LS2 and LS2P are used in conjunction with software that allows management of those entering and exiting a facility.